So, I have good intentions of sharing my dyeing outcomes. Instead, life sometimes gets in the way. Anyway, I have used several things to create dye including silver maple (Acer saccharum) seeds (aka helicopters), daffodils (which I have already posted on), irises, and amaranthus (amaranthus cruentus) seedlings. Normally, I will write down what I think will happen. Normally, the outcome is vastly different, although sometimes I am pretty good at guessing. Daffodils don’t count since I have already used them in the dyeing process. The silver maple seeds were taken from a tree that my husband Mitch cut down at my parents house a month ago. The seeds were just starting to come out, many were reddish in color, but most were a brilliant green. I put the seeds in a dye pot, soaked overnight and simmered for 45 minutes. I allowed the pot to cool and then strained off the dye liquid. 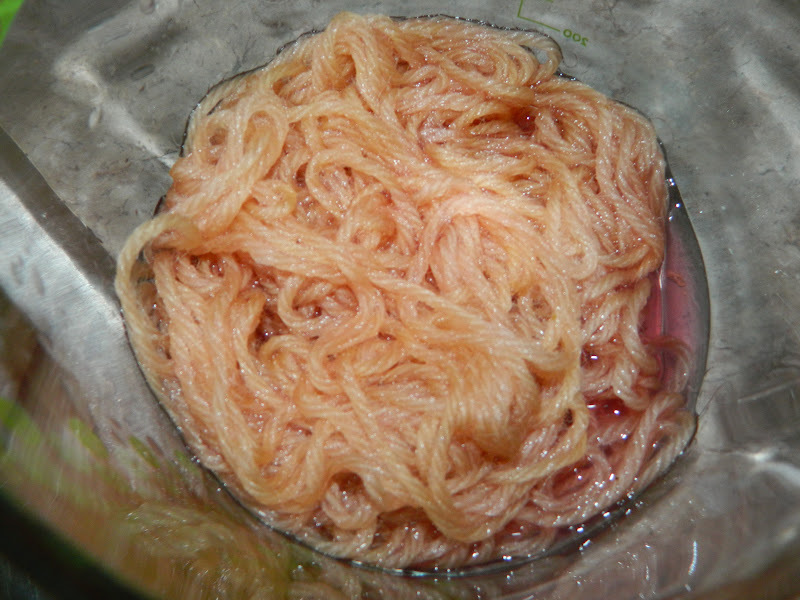 Using alum mordanted yarn, I simmered the dye again, allowed to cool and then took the yarn out. I rinsed the yarn until the water ran clear. The result was a minty brownish green. I think that I may have over-heated the seeds. I am not sure what color I should have expected, but I think the brownish color is a result from allowing the dye liquid to get too hot. My mom gave me several irises when we moved into our house. This is the first year that I have actually had any real blooms, or anything you could call success with them. Every plant I have had flowers on it this year. As the flowers wilted, I plucked them off and set them aside, careful not to get them wet. Again, I know what happened with the daffodils, and I did not want to go through that stink again! I poured enough water to cover and brought to a slow simmer. This takes a little bit of time and patience, which is something I have learned. I can’t just turn the heat up to high and have the liquid come to a quick boil and then allow it to cool, that damages the plants and gives you a different color then you would get had you allowed the liquid to come to a slow simmer. I guessed the flowers would produce a brown color (primarily because I wasn’t all that hopeful in achieving purple and I hadn’t found any information on using purple irises to achieve a natural dye anywhere). Since I started this project on the Friday prior to Memorial Day weekend, I poured the cooled liquid into a glass canning jar and allowed to cool over the weekend. When I poured the liquid in, it was a khaki color. After allowing to cool, the liquid was a pale purple. I wish I would have taken pictures of the initial color, but I was trying to get 3 kids ready to go for the weekend, plus clean the house. It just wasn’t on my priority list. 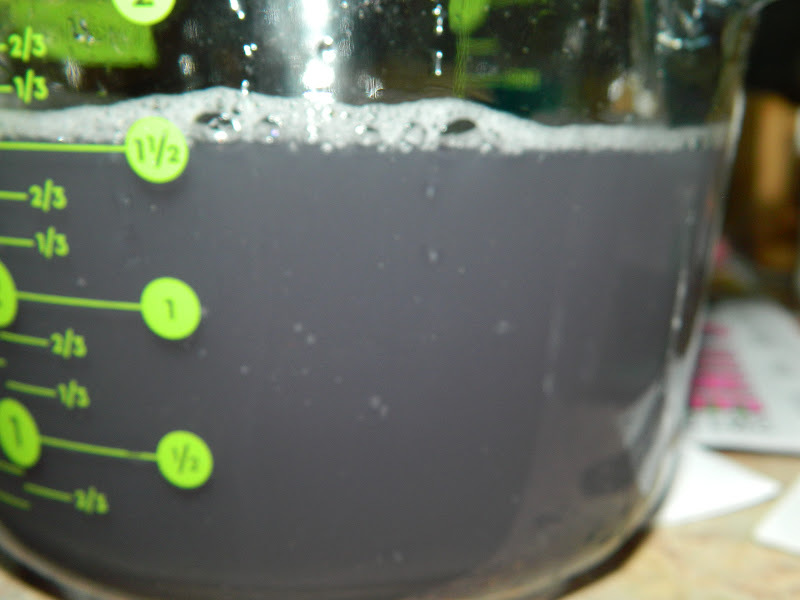 Here is a picture of the dye liquid prior to pouring it into the dye pot. It is such a lovely grayish purple color, I was really hoping that I would end up with this color on the yarn. After going through the dye process, I thought I would end up with this color on a lighter scale. After rinsing the dye out of the yarn, I ended up with a color completely unexpected. It is a green, but it is a soft sort of fairy green. I don’t know how else to describe it. You can tell that I used some kind of plant that had blue in it, but the hint is so subtle that from a distance, and even on the computer, it is difficult to tell. One job I hate doing is clipping seedlings in order to allow the bigger and stronger plants to thrive. I would rather let nature take its course, but in my experience, this just doesn’t work for me. Anyway, I have also found that I shouldn’t toss everything out, but try to find a use for it (when it comes to making natural dyes). I had roughly a handful of amaranthus seedlings. I poured 3 cups of cold water into the dye pot. Initially, the water turned the same brilliant red as the plant. I was kind of excited. 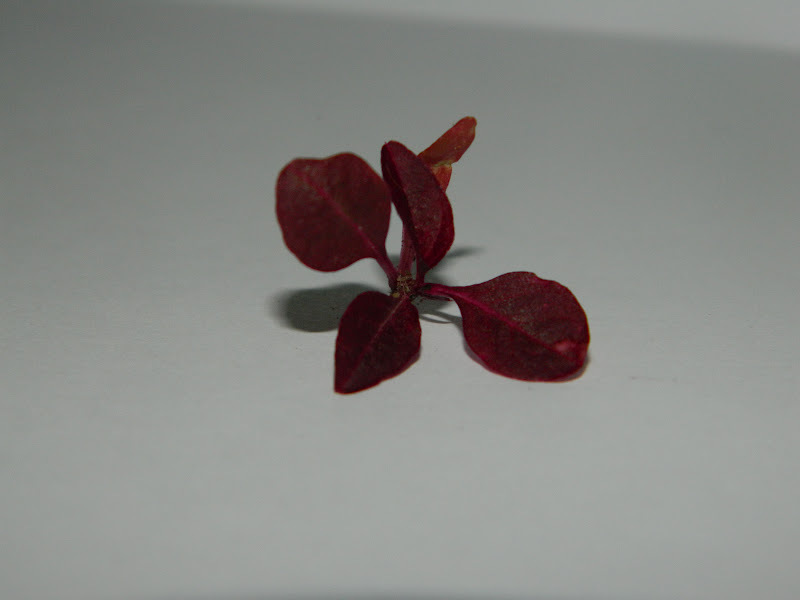 I know that this plant is suppose to produce a red dye, except it is is the flowers and/or the seeds that do the trick, not the plant itself. After bringing to a slow simmer (man, I am going to have to think of another way to say that! ), the water began turning a true yellow green. It was the coolest color. I thought it would be great if the yarn ended up turning that color! After allowing the dye to simmer for 20 minutes, I poured off the dye-stuff, and let the dye cool. I put the yarn into the glass jar I had the dye in. Again, I wish that I had taken pictures of the progression of this, and I didn’t. Maybe I will just have to try to use this plant again! 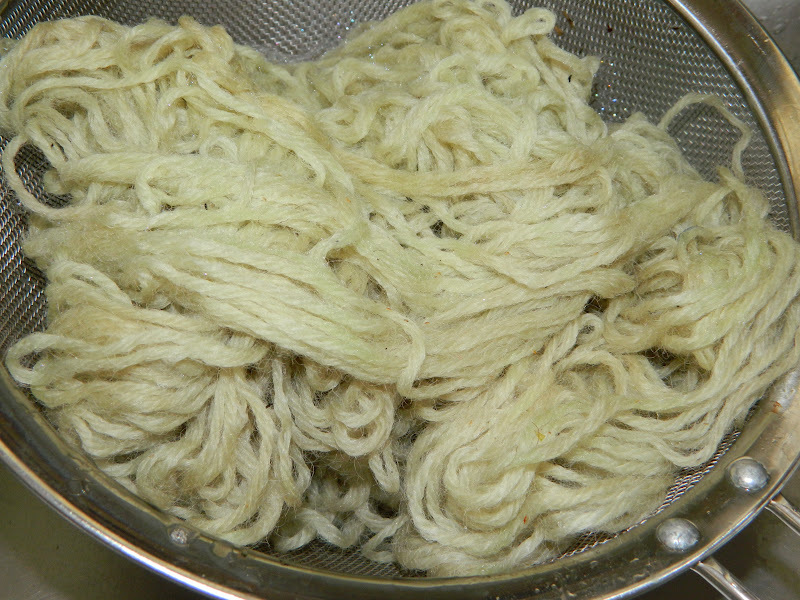 After allowing the dye to sit for several hours, the color of the dye went from this brilliant green-yellow to what you see below. Again, I was thrilled! A pink. I love it! Everything I have been making seems to have made a green, yellow or brown. Sometimes I think this is due to my own doing and I am sure that the plant might make a different color if I try to slow down the process just a bit. After roughly 24 hours of sitting in the dye, I took the yarn out to see this wonderful pink I was going to end up with. What I could do with pink, right? Wrong again. 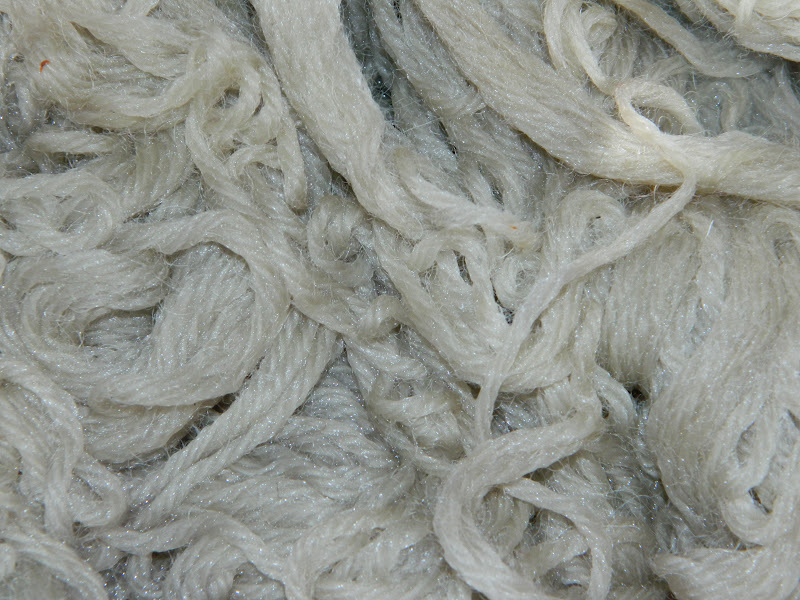 I took a picture of what the yarn looks like with half of it rinsed, and the other half not rinsed. Pretty amazing. I really am going to have to take an organic chemistry class just to satiate my interest. I don’t know how it all works, but I would love to know how! 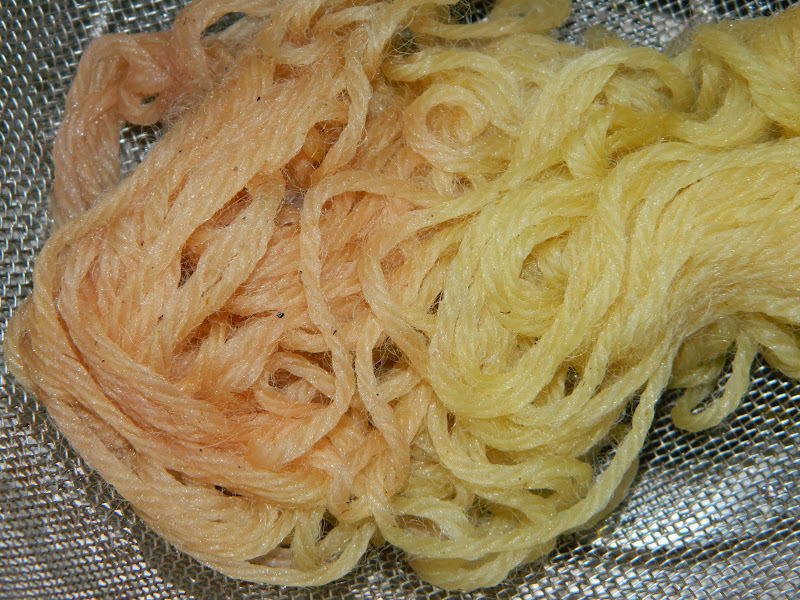 The end result of this yarn, was the yellow you see on the right. I still think that it is a beautiful color, I was really excited for pink though. My next experiments are on strawberries, peonies, false indigo and hickory. These posts will come sometime in the future. Hopefully sooner then later! 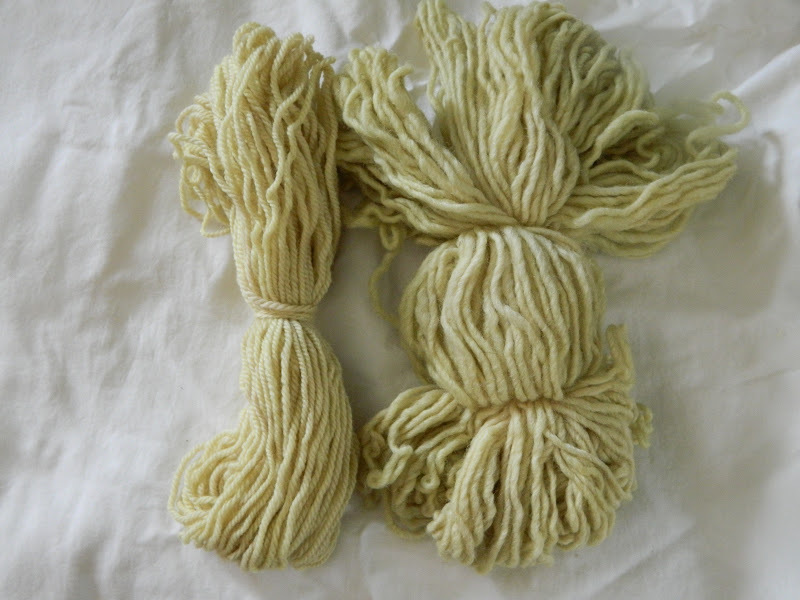 am dying some of my Shetland roving in amaranth leaf water now….can’t wait to see the progression as you demonstrated! Thanks for a great blog post! What have you gotten with the flowers of the Hopi? My plants are finally getting to flowering. I am new at this but have achieved good results with sage, zinnia, yarrow, sunflowers and marguerites. Any help would be appreciated.